Mix flour and glutinous rice flour, pour water little by little while diuleni until dough can be formed. If the water is too much, the dough so lemas.kalo have this, add the flour until sticky enough to be formed. Take the dough according to taste. Round the dough, set it in the steamer. Steam for 45 minutes to 1 hour. Lift. While still warm, prick with a skewer. 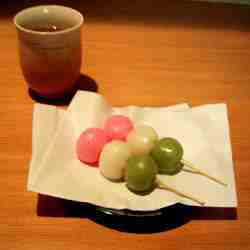 One skewer contents Dango 3-4, depending on size of dango. Enter the solution of starch / cornstarch (mix first so do not settle), reduce the flame. stir. Kalo is thick and popped it means is ripe. Turn off the flame while the mixture continued to stir. Heat the pan / rack to burn.